Choose the status and the form you wish to use. Note that “rejected” and “accepted” status are not listed here, since Moksha handles them differently. Click “Add” to save. You can also add and edit your forms by clicking the “Configure Forms” button. Note that authors are only notified once for each status. So if their submission is recommended multiple times, they will only receive the first notification. The email notification will be shown in the submission comments, so you may see that the author has been contacted. Moksha enables authors to withdraw their own submissions, as long as this feature is enabled by the publisher. Click on the “Withdraw submission” button and click on the confirmation button. This cannot be undone. You will be taken to the submission status page showing your submission has been withdrawn. You will also receive an email notifying you of the withdrawal. Go into your submission type settings by clicking “Edit” when viewing the submission type. In the “Details” section, scroll down to the “Allow withdrawals” option and set this to yes. Click the “Save” button at the bottom. Click on the “File Settings” tab. Moksha has the ability to schedule submission periods. 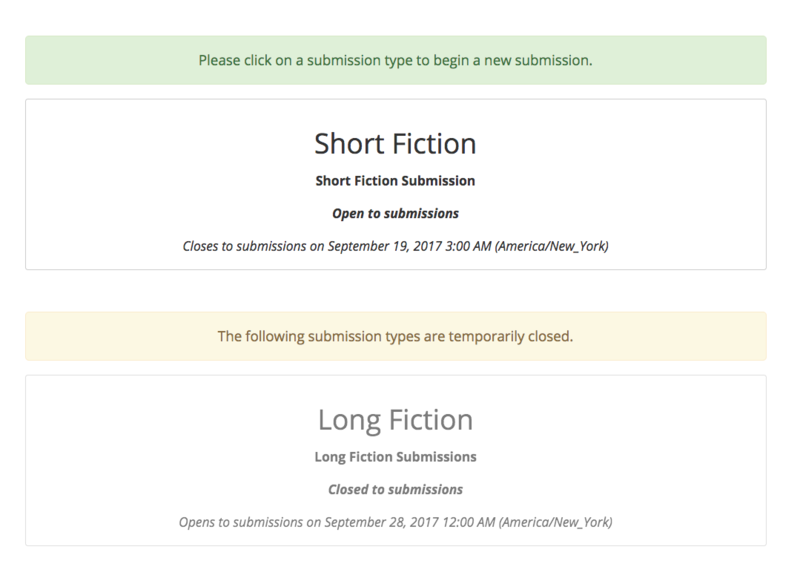 You can schedule your submission types to automatically open, close, or archive to submissions at a specific date and time. Visit your submission type settings page by viewing your submission type and clicking the “Edit” button. Scroll down to the “Submission Periods” settings and click the “+” to open. Here you can add or delete a submission period schedule. To add a new schedule, click the “Add Submission Schedule” button. Chose whether you want the submission type to open, close, or become archived, and select the time you wish this to occur. When the automatic scheduler is activated, the editor of the submission type (configured in the submission type settings) will be notified by email of the change. Note that Moksha will use the timezone you have configured in your user profile. Note also that if you schedule the submission type to open and the parent publication is closed or archived, the parent publication will open automatically at the specified time. Moksha will detect the user’s timezone, and display the scheduled date using this time, for convenience.